ELECTROSMOG: " the invisible pollution ". Electromagnetic pollution is the least detectable of all, since we can not see it directly, as we do with the toxic emissions of some traditional industries. On the other hand, is quiet, unlike the noise produced by road traffic or certain commercial activities. In short, do not perceive through our senses, and therefore most people do not take protective measures against it. Radiation by electromagnetic fields (EMF) is capable of passing all materials, including metals, a low frequency (B, 50 Hz). Is that physical ability, allowing you to "sneak" in our homes, if we do not have any shielding. Our home appliances can also be a source of EMF electromagnetic pollution. Only those affected, who live near major pollution sources, such as nests cell towers, electrical transformer stations, lines of high and medium voltage ... etc. , And the most noticeable effects of electro obvious way, through health disorders that affect the nervous system in the short term, such as depression and sleep disturbances. Electrosensible are patients diagnosed by physicians, and their number is increasing. This is due to electromagnetic pollution (EMP) is becoming increasingly accepted as a "new kind of pollution," unhealthy and harmful to human and animal health, well recognized by most doctors. Mobile phone masts locator (INFOANTENAS). Electromagnetic Pollution (EMF) radiation is due to the electric field (E) and magnetic (H), at different frequencies and powers depending on the service that caused it. The electric field is measured directly, whereas, to determine the existing magnetic field, we do it by measuring the magnetic field flux (B). The low-frequency electromagnetic fields (50 Hz) can be measured separately near field: electric field E (V / m) (volts per meter) and magnetic field flux B (uT) (microtestlas). However, for high frequency (1 GHz) and from 50 m. distance can be measured as a single power electromagnetic field S (mW/m2) (milliwatts per square meter). The mobile phone masts and antennas of wireless municipal WI-FI, radar, television and radio antennas, small home appliances wireless as wifi routers, DECT cordless phones, mobile phones, ... etc., are examples of emitting high-frequency electromagnetic fields. The electrical transformer stations, lines of medium / high voltage (power frequency of 50 Hz), and rail lines (frequency 16 Hz), and faulty home electrical installations, appliances such as microwave, dryer ... etc, are examples of sources of low-frequency electromagnetic emissions. In CEM-Ti have Measuring devices for home use and professional use to measure emf radiation at your home or business environment. We are distributors of GIGAHERTZ-SOLUTIONS and AARONIA equipments. We offer the best advice so that you can continuously measure EMF electromagnetic pollution of their environment, with Gigahertz or Aaronia equipment that best suits your needs. Contact us and we'll help you choose the protection and proper equipment. On the other hand, in CEM-Ti you have all kinds of insulation products to protect against electromagnetic radiation: paintings and foils, curtains and screens. 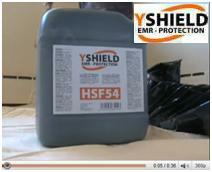 We are distributors of the shielding brands: YSHIELD and AARONIA. It's understood that non-ionizing radiation or particle wave is not able to boot electrons from matter that enlightens, but it does support electronic excitations. The negative effects of EMFs: Electro-sensitivity, Chronic Fatigue (CF), Fibromyalgia (FM) and Multiple Chemical Sensitivity (MCS). In CEM-Ti we perform electrosmog measurements (EMR), and equipment rental available. In CEM-Ti commercialize solutions shielding against radiation by electromagnetic fields of low and high frequency.